Artwork Panel: 27.7cm x 41.4cm ≈ 11" x 16¼"
Silk/Brocade: 37.1cm x 103.5cm ≈ 14½" x 40¾"
Original artist: Utagawa Kuniyoshi (歌川国芳) (1797 - 1861). 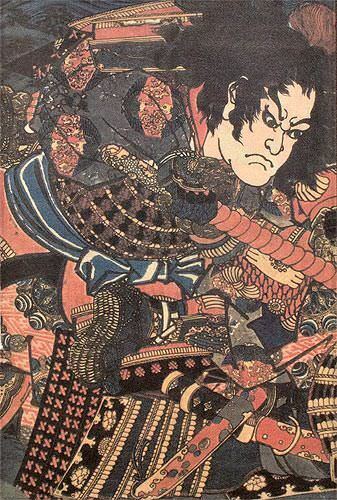 This is a reproduction of a very old Japanese woodblock print. This was made months ago, rather than centuries ago. Printed on handmade kozo (mulberry) paper (the same kind of paper the original print was made with). I used the latest Canon fine art giclee printer to create this high-quality reproduction before having the print mounted as a handmade wall scroll.